A dramatic evening of music and tales from Norse Mythology and the land of the Vikings. 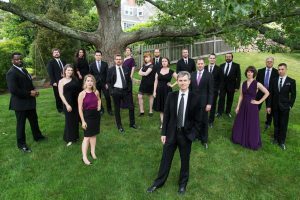 Skylark, “the cream of the American crop” (BBC Radio 3), is a premier vocal ensemble of leading American vocal soloists, chamber musicians, and music educators. Skylark’s dramatic performances have been described as “gripping” (The Times of London), “exquisite” (Gramophone Magazine), and “awe-inspiring” (Boston Music Intelligencer). Skylark strives to set the standard for innovative and engaging programs that re-define the choral experience for audiences and singers alike. Artistic Director Matthew Guard’s well-researched and creative programs have been described as “engrossing” (WQXR New York) and “original, stimulating, and beautiful” (BBC Radio 3). Since its founding in 2011 in Atlanta and Boston, Skylark has branched out to perform its dynamic programs in museums, concert halls, and churches across the United States. Skylark made its international debut in March 2018 at St. John’s Smith Square, London, as part of the UK choir Tenebrae’s Holy Week Festival. The Times of London declared that Skylark was “the highlight” of the festival that included some of the UK’s leading choirs, including The Tallis Scholars, Polyphony, Tenebrae, and the Gabrieli Consort. Skylark’s most recent three recordings all reached the top 10 of Billboard’s Traditional Classical Chart, earning praise for “imaginative” programming (Limelight Australia) and “singing of the highest standard for any area or any repertoire” (Classics Today). A not-for- profit entity with a passion for music education, Skylark performs educational outreach programs with high school and college students across the United States during its concert tours.